Dr. Young was awarded the Sir Harold Delf Gillies Award in 2005 for having the Best Basic Science Research Fellowship Paper granted by the American Academy of Facial Plastic and Reconstructive Surgery (AAFPRS). 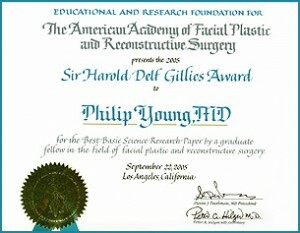 The Sir Harold Delf Gillies Award is named for Sir Harold Delf Gillies, a British otolaryngologist who was given the title “Father of Plastic Surgery.” The certificate is presented each year to an AAFPRS Fellow in an AAFPRS Foundation Fellowship Program who submits the best basic science research paper written during the fellowship year. The Sir Harold Delf Gillies award was given to Dr. Young for his discovery of a New Theory on Facial Beauty called the circles of Prominence. Previous theories have concentrated on external landmarks that a viewer does not use to assess Facial Beauty in a new face. The neoclassical cannons, the golden mask theory, the theory of averageness, cephalometry, and the golden number of Phi, have all come short. These theories have focused on external landmarks that a viewer spends little time looking at when assessing a face. A theory that's going to answer the question of what makes a face beautiful needs to be centered on what one looks at in a face. The circles of prominence hypothesizes that it is the iris that people look at the most. Hence, everything on the face has an ideal between zero and infinity and because we spend so much time looking at the iris that is our measuring stick to determine the ideal length and shapes of many objects in the face.